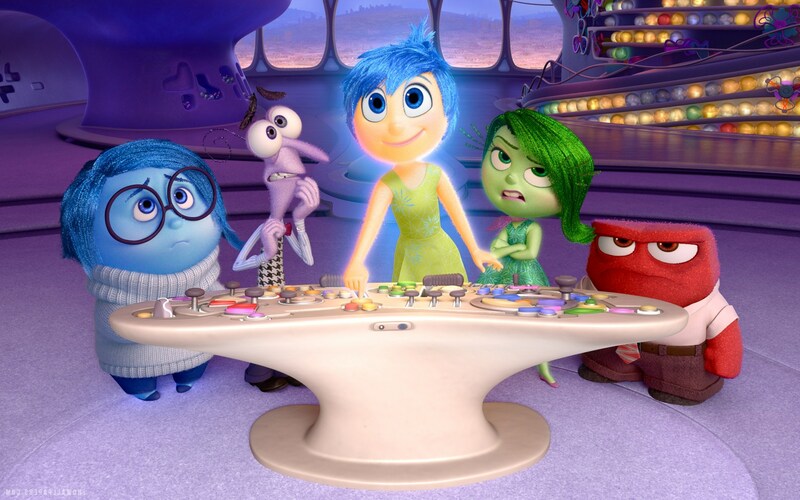 Once again Pixar and Disney push the boundaries of intelligence with their summer blockbuster INSIDE OUT. Producing a film which appears for kids, but is actually more for adults is a speciality of Pixar’s with the likes of TOY STORY and a BUG’S LIFE being the leaders in this area of expertise, but none have ever challenged the mind as much as this hour and a half feature. Riley is your regular little girl growing up in the mid-west of America, whose life turns upside down when she moves to San Francisco. Controlled by her five emotions in ‘Headquarters’ i.e. Riley’s mind, Joy (Amy Poehler), Sadness (Phyllis Smith), Fear (Bill Hader), Disgust (Mindy Kaling) and Anger (Lewis Black), Riley tries to deal with this huge change in her life with her handful of emotions conflicting on a daily basis. After what appear to be her two core emotions, Joy and Sadness, find themselves in the long-term memory part of Riley’s mind, away from ‘Headquarters’, it is up to Fear, Disgust and Anger to aid Riley through this new change while Joy and Sadness fight to get back into her mind. As you can tell from the above synopsis, the plot of this film is not your regular, simple Disney storyline. Although this may disappoint a lot of parents out there and understandably turn them away from taking their children to see this film, it keeps the brilliance of Disney and Pixar alive in the minds of adults across the world. 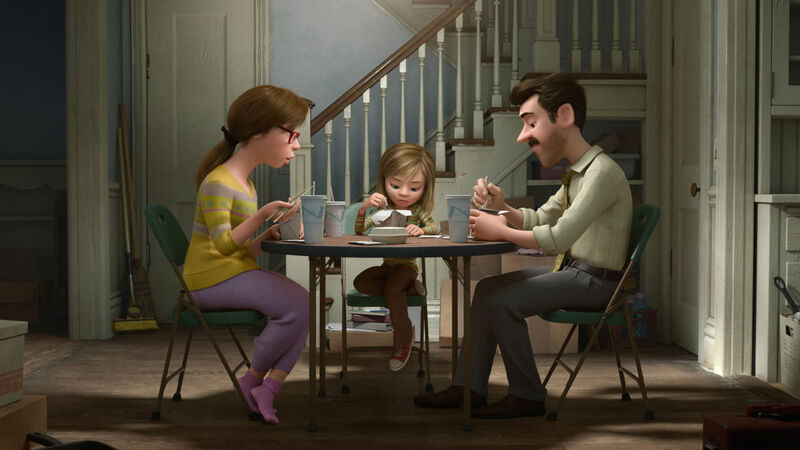 There are many intelligent scenes in this film, but none compare to the scene below where a regular mother and father are sitting at the table for dinner, trying to grab their daughter’s and each other’s attention and we see a glimpse of each family member’s brain in action (Watch the trailer below for this awesome clip!). Joy is as infectious as she sounds and looks from the pictures in this review, and you are always rooting for her to help Riley out of her daily troubles. Anger is very funny and his interaction with Disgust and Fear works very well. 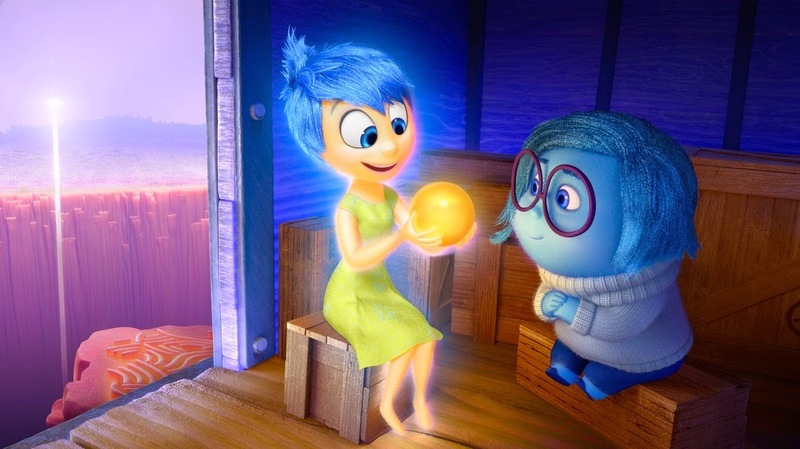 Sadness, on the other hand, is not so much sympathetic, but rather annoying throughout the majority of the film. Voiced by BAD TEACHER’s Phyllis Smith, her character constantly tries to sabotage Riley’s happiness and this makes the viewer struggle to understand how the rest of the emotions have put up with her for so long. Overall, INSIDE OUT is a genius play on every-day life and keeps you questioning your own mind while laughing out loud throughout. It may not have excited me or blown me away as much as BIG HERO 6 earlier this year (the first official collaboration between Disney and Marvel Studios), but it certainly stands out as a film of the year! Recommendation: If you can still catch it while it is out at the local cinema (albeit at adult unfriendly times) definitely make the trip! It is definitely one to wait for on Blu-Ray otherwise.